According to the EU directive on consumer rights, you can return the purchased item within 14 days from the date of its delivery. 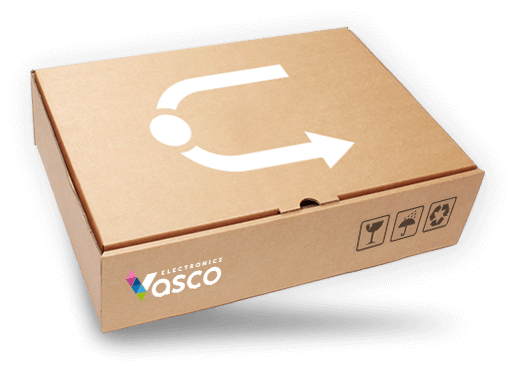 In order to return the purchase, please notify us about your intentions at contact@vasco-electronics.co.uk. You will be reimbursed in the same way you paid for the item, unless you indicate otherwise in the form. The refund will be made within 14 days from the day of notification about your return. The refund may be withheld until the item arrives at our office. We reserve the right to make a deduction from the reimbursement for any loss in value of the goods supplied if the loss is the result of improper handling by the Buyer. The returned item should be well-secured. The consumer takes responsibility for diminishing the goods’ value during transport. The item should be returned at consumer’s expense. The shop will not accept “cash on delivery” parcels.